Making an Impression with Printers – Looking for outstanding output at reasonable cost? Here’s some advice for potential printer purchasers. The Nuts and Bolts of GEOS to RUN Paint – How to transfer geoPaint screens to RUN Paint with your C-64 or 128. Friendly File Copier – Fast and menu-driven for ease of use, it works with any two Commodore-compatible drives and your C-64. Caribe Bein’ – Create your own online character and mingle with others in QuantumLink’s new tropical hot spot. Non-Habitat Forming – How Club Caribe came into being. Build a Better Basic – Add a host of structured commands to your C-64’s built-in-Basic. Wall Street 128 – Make and break fortunes with roller coaster price fluctuations in this C-128 stock market game. Deep C-64 World – Turn your C-64 into an underwater wonder to delight your eyes in this colorful electronic aquarium. 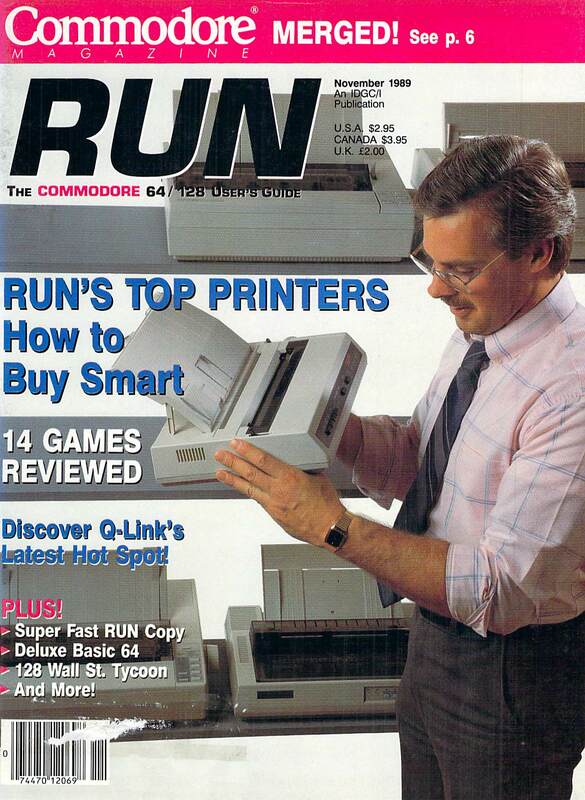 RUNning Ruminations – RUN acquires Commodore Magazine. Mail RUN – Readers tell about their unusual applications, and RUN solves the Case of the Jumping Pointer. Games Gallery – Take a high-speed chase to car-and-motorcycle racing fun and excitement! geoWatch – Benefit from this GEOS user’s experience and design your own fantastic fonts.